SINGAPORE - Students who are training to be teachers at the National Institute of Education (NIE) will soon be doing more research in education and learning from universities and schools overseas. From August, students in NIE's bachelor of arts (education) and bachelor of science (education) four-year degree programmes - more than 50 of them in this year's incoming batch - will take on a revamped curriculum, which will have more overseas experiences. They will go on four teaching practicum stints in schools, including a five-week attachment in a school overseas, in countries such as Finland, Sweden, China and the United States. Previously, most students would spend their four stints in schools here. Only about 10 per cent of the cohort went on international practicum, which NIE started just two years ago. All third-year students will also get to go on an exchange programme overseas with universities such as University of Helsinki in Finland, Linkoping University in Sweden and Tsing Hua University in China. In the past, less than 10 per cent of each cohort would go on overseas exchanges. In the fourth year, they will also go overseas to present their research findings at conferences, and network with fellow educators. From this year, it will also be compulsory for students to do educational research with academics, so that they can understand students' needs better in the future. 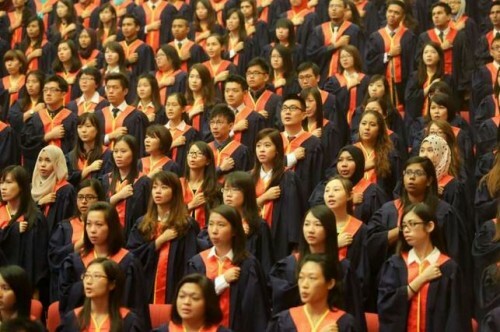 Education Minister Heng Swee Keat announced these initiatives at a ceremony on Tuesday, where 210 students received teaching scholarships. He said that the revamped curriculum is part of his ministry's efforts for teachers to master their content well, and to be equipped with research and knowledge on teaching and learning skills. Ms Lau Kai Jing, 19, who will be studying the Chinese language in NIE's bachelor of arts degree course this year, said she hopes to go to Peking University in China for an exchange programme. "I want to enter NIE because I see it as a chance to learn pedagogical skills and content side by side so that I can relate both to each other," she said. "I also hope to find out new ways of teaching Chinese, and learn how to engage students in this environment where families are speaking more English."